As part of our occupation, Implosionworld.com photographers have become accustomed to documenting disaster scenes around the world. However, recently the disaster came to us. 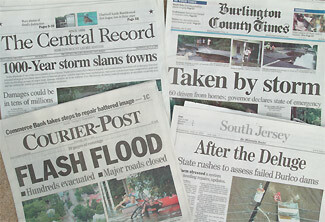 On July 12th & 13th, 2004, a freak "1,000-year storm system" stalled near Implosionworld.com's headquarters in Hainesport, New Jersey, dumping an incredible 13.2 inches of rain in less than 24 hours. This caused 12 dams in the area to fail, which resulted in sudden massive flooding and the deployment of major rescue operations. Businesses as close as 1,500 yards from our offices sustained substantial damage, although the worst flooding occurring about a mile south in Lumberton and farther along the Rancocas Creek in Medford Lakes. Governor Jim McGreevey declared a State of Emergency within hours, and President Bush declared the region a Federal Disaster Area. FEMA, the National Guard, and dozens of local organizations have since been working to return the area to normal. Below are images captured by Implosionworld.com and Protec photographers during the flooding and its aftermath, several of which you may recognize from newspapers and periodicals. Click on the thumbnails to enlarge the photograph with caption.